Philip gives a lot of his lunch hours to God’s Whisper or my projects. (Visit here for the cover he designed for my book.) 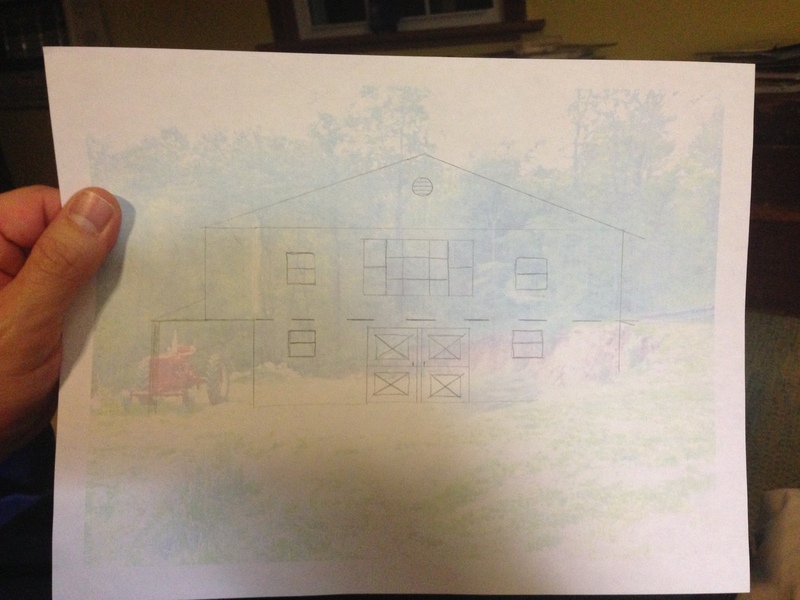 Today, he put together sketches for our barn so that we can contact a company and get started with price quotes. I didn’t take a great photo, but if you look closely at the photo, you’ll see that we’re going to have a working barn on the lower level – with stalls for goats and alpacas and a garage and workshop for Philip. Upstairs, we’ll have a wide open concert and reading hall. At one end, probably by the big window you see here, we’ll have a stage so that everyone can enjoy the view while they savor the performance. We’ll have space for potluck dinners, and comfortable chairs. Then, the loft will have storage space and a place for the band to stay after they play. We’re very excited about this plan, and we’re eager to share more details with you as they come together. Stay tuned for details, and come the new year – keep an eye out for our Kickstarter campaign that will get the building – and the party – started. P.S. Tomorrow, we’re going to tour a goat farm, so that means great goat photos and great goat info.